Where did Jarvis Collegiate get its name? Where did Jarvis Street get its name? Why did Samuel Jarvis need money so urgently that he would sell off his beloved estate, Hazel Burn, thus creating Jarvis Street? First question: “Where did Jarvis get its name?” The school was named after the street. Take note of that, please—after the STREET! It was not named in honour of William and Samuel Jarvis. They did give the name Jarvis to the street, and it might be natural to believe that the school was given the name in their honour. But it was NOT! It was named after the street, definitely not the men. In fact, William and Samuel were such nasty pieces of work that a school would have a hard time being proud of them. You can read lots of about them later in this document and in other documents linked to this one. But for now, let’s finish the story of how the school took on the name of its street. W hen the school opened in 1807, it wasn’t on Jarvis Street because, simply, there was no Jarvis Street. 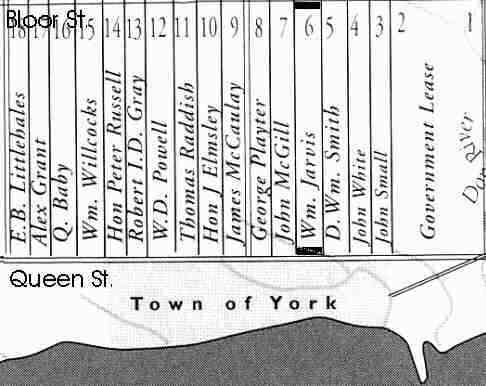 The new province of Upper Canada was in its infancy, and the very first high schools (“grammar schools”) were being established, one for each district of the province. Our first name, consequently, was the Home District Grammar School, since the Toronto area was called the home district. The school grew as the years and decades passed, and the name changed a number of times. In 1873 it was given a rather grand title, Toronto Collegiate Institute. But that name lasted only 5 years until the city got its second collegiate in 1888(Jameson Avenue High School, which took the name Parkdale in 1889). In 1888 the almost-final name appeared—Jarvis STREET Collegiate Institute. Second question: “Where did Jarvis Street gets its name?” T o answer this question, there’s no getting around it, we HAVE to mention the Jarvises. Jarvis Street was named after a person, of course—Samuel Jarvis, the man who owned the land on which the street was first built. But about 50 years after the original land grant, in 1845, Samuel suddenly needed money urgently. He decided he had to sell off a large part of Hazel Burn, his family inheritance. He kept the land north of Wellesley Street for himself, but subdivided the southern portion into lots. The buyers of the lots needed a way to reach their property, so Samuel had a new north-south road built—and that road became Jarvis Street. Third question: “Why did Samuel Jarvis need money so urgently that he would sell off his beloved Hazel Burn?” Y es, well, then . . . Before 1845, Samuel lived a comfortable and complacent life, enjoying the income and status of a high government office as chief superintendent of Indian affairs for Upper Canada. Unfortunately for Samuel, his superiors had grown suspicious of him and had been investigating his operations, especially the way he handled money in his department. In 1845 they issued their report, which accused him of stealing large sums of money from the government. The actual amount varied in the estimates, with a low estimate of 4,000 pounds and a high of 9,000. This public condemnation spelled the end of Samuel Jarvis’s career. He was forced to resign in disgrace. Among the very few things Samuel Jarvis left to the public was the name, Jarvis Street. That’s the short answer to the question “Who was Jarvis?” But there are more interesting stories about William and Samuel Jarvis who, if nothing else, were “colourful” characters. 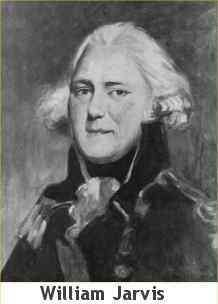 Starting with nothing, William was catapulted into the top ranks of officialdom in Upper Canada. His son, Samuel, shared his father’s disinterest in ethics but had his own violent temper.